Male and Female Common Goldeneye Watercolor – Let's Paint Nature! Yesterday I went on a birding adventure at Red Oaks Nature Center with the DuPage Birding Club. 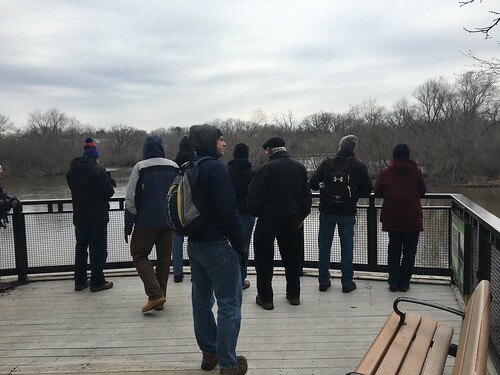 Red Oaks is located adjacent to the Fox River and has an observatory deck right over the river, perfect for viewing waterfowl and migrating birds. When birding, it is helpful to go with a group of knowledgeable people who know their birds. The Dupage Birding Club has such individuals who can identify birds by sound alone! That is very impressive. A few pairs of Common Goldeneyes were entertaining us across the river. I enjoyed watching them submerge their entire body underwater to catch their meal. 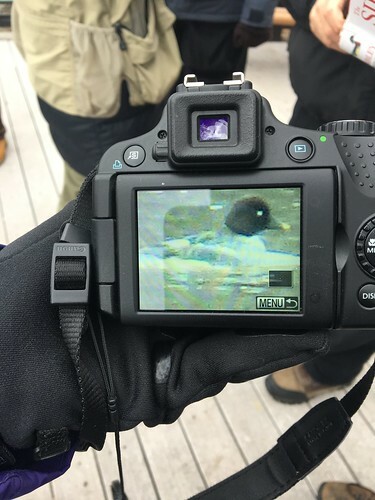 One birding member caught a picture of a female. I took a picture of her picture, which inspired my sketch. 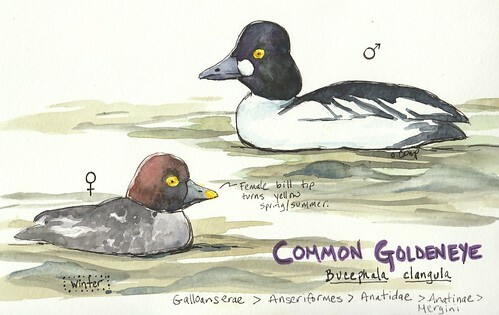 Common Goldeneyes remain in Illinois for the winter. Do you see the female’s bill? The tip turns yellow for spring/summer…….. Shhhhh we wont tell her it’s not spring yet! Soon, probably in March, these ducks will leave and not return until late October/November. The cold did not put a damper on our birding adventures. This day it was overcast, windy, and 35°F. Birding is quite fun and almost like a game…. you win when you spot a species and add it to your list. Every season has new birds. It’s a great way to get out of the house, not spend money, and enjoy nature! That’s awesome! Great list! I too heard Sandhills but could not see them in the sky. Yahoo has a group called ibird…. it’s an Illinois birding group and they regularly post when they see birds. It’s a good group to connect to because they’ll alert when migrating birds are in the area and will say when and where they are spotted.